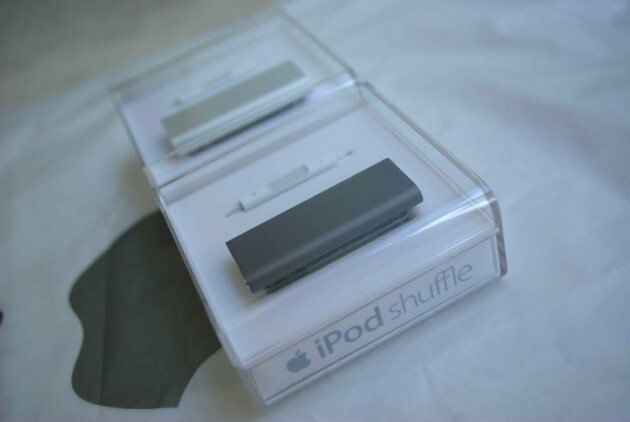 For an Apple product, the new iPod Shuffle is a bit underwhelming in the aesthetics department. It’s tiny, for sure, but I can’t and most likely won’t ever get over the fact that I have to use Apple’s earbuds. What am I supposed to do with my Ultimate Ears and Shures? The controller itself sits a bit higher than expected and probably would be better served had it been placed a few more inches down the cable. It’s a bit chintzy and I’m sure Apple stores will see droves of folks coming in with broken earbuds. The Voice Over feature works with non-iTunes purchased music (aka pirated music!) and flipping through playlists is easy as pie, but you have to listen to the little robotic man in the Shuffle tell you which track and artist is playing before you can get to your playlists. That’s a bummer right there. The only time I foresee myself having to use the Voice Over feature is if someone else is listening to it and they want to know what’s currently playing. I doubt I’ll be making playlists if I have to go through the whole process every time. Is the new Shuffle worth $79? Put it this way: I’m just glad I can expense this unwanted Apple purchase.